The nation of Cygnar has temporarily secured an invaluable dragon athanc—a stone of incredible power—from the forces of the Nightmare Empire of Cryx, but the Cryxians are not the only ones still seeking the stone. While Cygnar’s armies march off to war, two of its greatest heroes, Major Victoria Haley and Constance Blaize, find themselves swept up in what could be the final chapter in a conflict between dragons older than the nations of the Iron Kingdoms themselves. As the clash between the dragon Everblight and his brethren unfolds, the only hope for the two warcasters to save the land lies in deciphering a series of prophetic messages from the athanc itself. Yet another, more sinister threat waits in the wings. 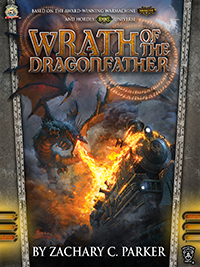 Will their efforts be enough to alter the course to ruin, or will all of Cygnar burn beneath the progeny of the Dragonfather?